Europe needs to take tougher action to stop fundamentalists entering the region, according to the Syria-based leader of an ancient worldwide Church, who warns of the threat posed by a new generation of radicalised Muslims. His Holiness Ignatius Aphrem II, the Damascus-based Patriarch of the Syriac Orthodox Church, said that, while many Muslims coming into Europe were peace-loving moderates, governments “must be prepared” for increasing numbers of extremists who reject Western values and want to impose Shari’a law as widely as possible. Among new measures to be explored, the Patriarch, who leads a Church of more than 5 million across the world, suggested the screening of new arrivals suspected of fundamentalism – specifically people coming in from Islamic countries and Europeans returning from visits to the Middle East and other Muslim-majority countries. Highlighting the threat to civil liberties from a screening process inappropriately applied, the Patriarch nonetheless stressed the need for more action to protect Europe from radicals wanting to introduce Shari’a law and impose Islam on the West. 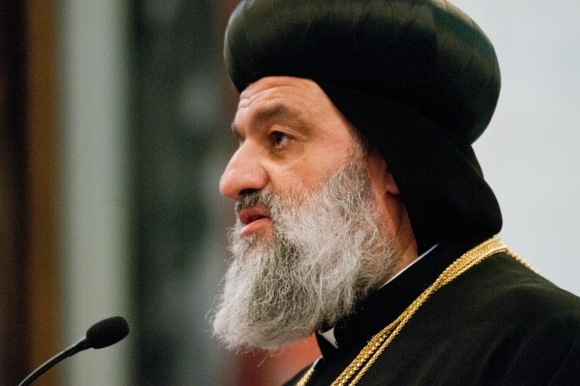 In an interview with Aid to the Church in Need, the Patriarch said: “There should be a way of screening those who come to Europe so that they do not embrace extremist ideology. I do not know how this should happen but it is necessary and should be done without infringing the rights of those who are peace-loving and law-abiding. Patriarch Aphrem went on to warn that Christianity in Syria and Lebanon as well as Iraq was at risk of disappearing. He said that 80 percent of Christians in Iraq had left the country since the overthrow of President Saddam Hussein in 2003. Turning to Syria, he said that since war began there in 2011, 50 percent of the country’s Christians were either internally displaced or living as refugees abroad. He added that in Lebanon many refugee Christians were so poor they had no option but to leave the region. The Patriarch went on to thank Aid to the Church in Need and other organisations for their work in providing emergency help and spiritual support for tens of thousands of people struggling to survive in Syria, Iraq and elsewhere. ACN is providing food, shelter, medicine and pastoral help for Christians and people of other faith in great need. Patriarch Aphrem will be guest-of-honour at the UK launch of Aid to the Church in Need’s Religious Freedom in the World report which assesses the situation of all major faith groups in every country around the globe. The UK launch takes place in central London on 24th November.